Mix Velveeta, onions and bacon in large microwaveable bowl. Microwave on HIGH 2 min. or until Velveeta is completely melted, stirring after 1 min. 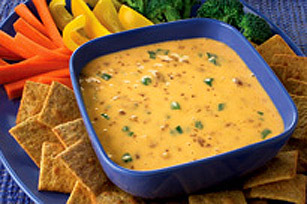 Serve hot with assorted cut-up fresh vegetables or Christie Wheat Thins Crackers. Cut Velveeta loaf into slices about 1/2-inch thick. Then, cut each slice crosswise in both directions to make cubes.